The little brown bat is a small mammal with a body length of 3 - 31/2" and weighing approximately 1/8 to 1/2 an ounce. The wingspan of little brown bats range from 6 - 8". Bats are the only mammals that engage in truly active flight. As their name suggests they are glossy brown above with a light buff color below. These bats can live 20 to 30 years. The Little Brown Bat is found from Labrador west to central Alaska and south to the Appalachians in Georgia and Arkansas. Located in most states except Florida, Texas, and southern California. The little brown bat is found abundantly throughout New Hampshire. 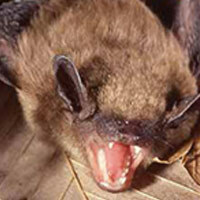 Little brown bats are insectivorous, eating a variety of insects including some agricultural pests. They can eat 50% of their own body weight each evening. During gestation and lactation, even more insects are consumed. These nocturnal mammals use echolocation to navigate and locate prey. Bats hear high frequency sounds emitted by their prey enabling them to distinguish contracting a muscle in the ear, these bats can block out their own sounds while still detecting prey. Little brown bats feed primarily over wetlands and other still water where insects are abundant. They use rivers, streams, and trails as travel corridors to navigate across the landscape. Bats will occasionally swoop down close to mammals to indulge on the insects that swarm around them, not to make a nest in the hair. Little brown bats hibernate in clusters during the winter months. House attics and walls, caves or mines are preferred but large tree cavities with favorable microclimates may be used. In order to minimize evaporative losses the humidity in these hibernation areas must be high, preferably over 90%. A constant temperature of 40 degrees F is desirable for hibernation. Sexual maturity is reached in 6 to 9 months for females and a year for males. Breeding occurs from September to October but the female stores the sperm for fertilization in the spring. The young are born from mid-June to early July. Little brown bats generally have one offspring per year, occasionally two. The young become self-supporting within a month. Little brown bats seek cavities for shelter, roosting and brooding. In summer females brood their young in dark, warm sites such as barns, attics, caves, hollow tree cavities and other protected areas. Little brown bat roost sites are highly variable and not well known. In temperate regions, they often use cavities along forest edges with high sun exposure. A medium-sized bat with upper parts rich chestnut brown; ears relatively small, thick, leathery, and black; membranes blackish; under-parts paler than back; ears and membranes devoid of hair, or nearly so; wing short and broad, length of fifth metacarpal almost equal to that of third. Big brown bats are one of the most widely distributed of America's bats, ranging from Canada to northern South America and the Caribbean Islands. Big brown bats are most often found in trees, attics, and bat houses in the summer. Maternity colonies can consist of hundreds of females, although smaller colonies are more common. Big browns usually enter caves or buildings where they will hibernate safely throughout the winter months or they will migrate. Young ones (called pups) are born in nursery colonies where females congregate together. The usual litter size is two bats in the eastern United States, and one pup in the western U.S. Pups are born without any fur and with their eyes closed. Immediately after the pups are born, they begin to squeak, and within 24 hours their eyes are open. For the first two weeks of life, while the mother bat is at rest, the young stay nestled under her wing. During the third week they are able to fly, and practice until they can negotiate their own turns, land, and hang well. Pups completely stop nursing from their mothers at about 9 weeks old, and at this time are able to eat insects on their own. Of all the North American species of bats, this is the one most closely associated with humans because of its year-round use of buildings. Big brown bats are highly beneficial to humans because they consume extremely high numbers of insects. Even though big brown bats are abundant throughout the United States, their populations are decreasing every year. The population is lowing because of human disturbance (the bats are especially vulnerable when hibernating), people killing bats (especially when bats accidentally fly into people's houses), and loss of habitat.